Amid uncertainty regarding the İstanbul local election results, the ruling Justice and Development Party (AKP) and the main opposition Republican People's Party continued to exchange statements over the weekend. 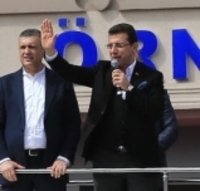 According to the unofficial results, Ekrem İmamoğlu, the candidate of the informal Nation Alliance led by the CHP, edged his rival Binali Yıldırım, the candidate of the AKP-led People's Alliance, by around 14 thousand votes. The process of appeals and recounts has been going on since the March 31 polls. CHP Deputy Group Chairs Özgür Özel and Engin Altay announced on Saturday that they expect to be given the certificate of election by Monday. "If I was your candidate, what would you think?" The winning candidate İmamoğlu also made a speech at the ceremony of handover for the Beylikdüzü District Municipality, which he was the previous mayor of. Addressing AKP supporters, İmamoğlu asked, "If I was your candidate, what would you think?" "This nation is fed up with the politicians who make a lot of noise. This brother of yours will try to be the symbol of tranquility. "Please don't remove my smiling face from your memory. I will take over the duty. Brother, if I didn't cheat you of your rights, I don't let anybody cheat me of my rights. It is this clear." İmamoğlu also reminded that when Recep Tayyip Erdoğan, the current AKP chair and President, was mandated when he won the İstanbul mayoral elections by a narrow margin in 1994, saying that the government at the time didn't hesitate to hand over the Metropolitan Municipality to him. "Some people unite their nation with one vote"
Speaking on the results every day since the elections, İmamoğlu also addressed people yesterday (April 14) in the Esenyurt district. Responding to President Erdoğan' words that "no one should think they won by a margin of 13 or 14 thousand votes," İmamoğlu said, "Some people unite their nations even if they are elected with one vote." "Don't drag on the process, brothers. The nation gave the mandate. I call out to the Supreme Election Council (YSK). Do your duty, normalize us. Don't make us ashamed in front of the world. Open our way, strengthen our democracy," İmamoğlu remarked. AKP Deputy Chair Ali İhsan Yavuz also made a statement yesterday, saying that their preparations for an application for a repeat election in İstanbul are nearly done. "We said that we will request the İstanbul elections to be repeated by using our right to raise an extraordinary objection. We have largely completed our preparations. In a very short time, we will submit the petition and its attachments to the YSK inshallah," Yavuz tweeted. AKP ally Bahçeli: "This one can't be a mayor"
Devlet Bahçeli, the chair of the AKP ally Nationalist Movement Party (MHP), said that İmamoğlu can't be a mayor after he went to a football match in İstanbul on Saturday. In the game between Beşiktaş, one of "the Big Three" of İstanbul along with Fenerbahçe and Galatasaray, and Başakşehir, a team that Erdoğan said "he founded" and called his base to support it, the home team's supporters chanted "Give the mandate to İmamoğlu." Bahçeli said yesterday that "Moving the mandate to the stadium is a seed to turn the competition between the supporters into political enmity. This one can't be a mayor."